Critical Appraisal of the medical literature is a key part of the armamentarium of a good Emergency Physician, not just to pass tricky exams, but also to stay up to date with new evidence. We are very lucky to have some very experienced researchers on our team at St.Emlyn’s, including not one, but two Chairs of Emergency Medicine (commonly called a “Sofa”). 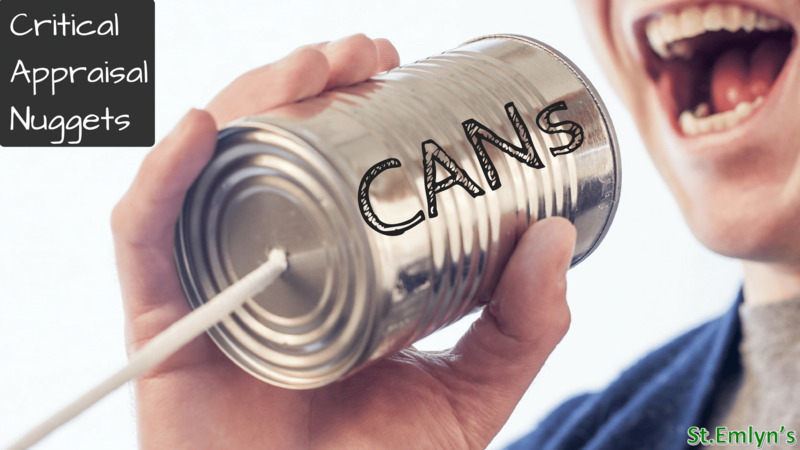 We wanted to make the most of this expertise and are delighted to bring you a new feature on the St.Emlyn’s Podcast – the Critical Appraisal Nuggets (the St.Emlyn’s CANs). These are designed to be quick reminders and study guides to everyone who reads the medical literature. Sure you can go look at every single one of these topics in more detail, but a quick podcast is a great way to learn the essentials if you’re new to critical appraisal and for those who’ve been around a while we hope you find them a useful reminder. In these short episodes, brought to you fortnightly between our main episodes, we will go over different aspects of critical appraisal in an easily digestible way. These will then be aggregated in a permanent reference page on the website so they can be easily accessed. We recognise that this forms an important part of post graduate exams and so will aim to cover over time all the key topics that could be tested in FRCEM exams. This is new feature of our podcast and we hope it will complement really well all of the other great resources out there that are examining the medical literature. We may even take our lead from recent episodes of other podcasts about which aspects of critical appraisal to look at. Please have a listen to (Prof) Simon and (Prof) Rick discussing “Randomisation” in our first episode and let us know what you think. After all, we want to make sure the podcast is as useful and interesting as it can possibly be.